Tommy and Lasse are Logmar. The company was founded in 2009 in Lasse’s house in the Danish city Aalborg. Today, it houses a CNC lathe, a MakerBot 3D printer, an SMD assembly machine and even a reflow machine for the professional manufacturing of high component density controller boards. A big box with discarded control circuit board prototypes tells of the ceaseless and painstaking work done by father and son. Speaking of the camera mechanics alone, we’ve thrown away our work and started from scratch five times. Or was it eight times? I stopped counting. But what made them invent a new Super 8 camera, thirty years after the last regular model had been launched? It all started with a Krasnogorsk, the inexpensive and quirky Russian 16mm film camera. Tommy and Lasse once developed a drop-in replacement board for it. It was easy to build in and allowed every owner of the camera to completely replace its guts with a high precision electric motor drive, reliable exposure metering and a modern power supply. Although the project was ready for the market, it died a premature death since there were other third-party motor solutions, and the Krasnogorsk’s manufacturing quality was too uneven. Tommy and Lasse realized: Better start from scratch and get rid of all legacy technology. First, Lasse wanted to build a better digital Ikonoskop camera. Today, he’s glad that he didn’t try since he had grossly underestimated the complexity of the task (like Ikonoskop’s developers did, too). There would have never been enough time to properly engineer the signal processing and a system for the vast amounts of data the camera would have to wrestle with. Logmar, after all, is a side project. Other players have more staying power. Every two weeks, there is a new digital film camera. It’s a highly competitive and well-served market. But Tommy and Lasse knew how many Super 8 cameras, Super 8 films and Super 8 filmmakers there were still out there. All of them still have to shoot with cameras that are at least 30 years old and have various deficiencies. This was enough motivation to build something different from everyone else: a new, analog camera, for the first time after a couple of decades. 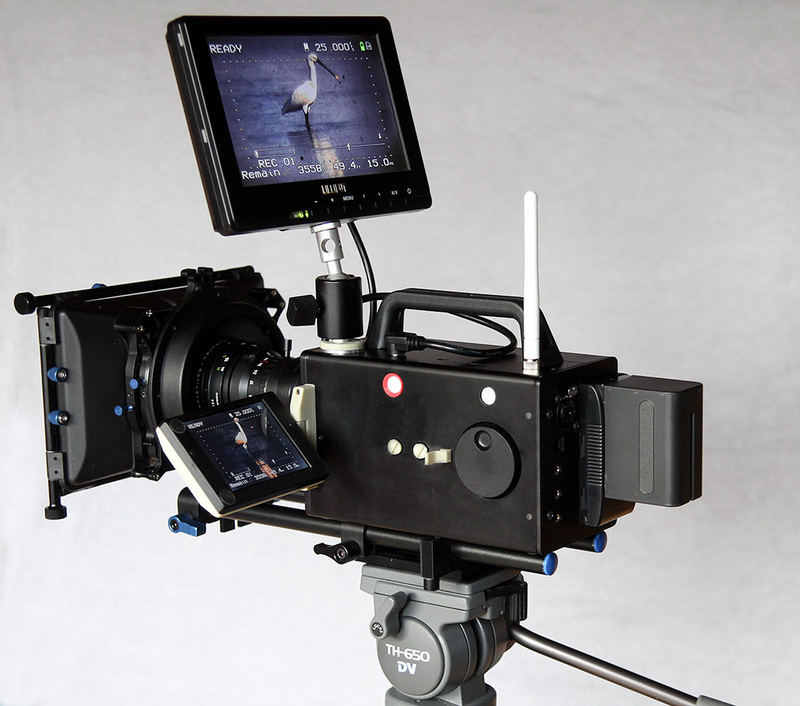 Initially, Lasse wanted to create a 16mm camera because „16 simply is more than 8“. But the two men had a hunch that 8mm would be a better choice. Super 16 is dying out faster than Super 8. There are more Super 8 cameras, more Super 8 filmmakers, more projectors, and it’s more affordable. Our whole family thinks we’re nuts. Well, everyone does, actually. Lasse never shot Super 8 himself. His first camera was an NTSC video camera, with the usual inferior image quality. What both men found missing in Super 8 was some simple solution for high quality sound. So far, small gauge filmmakers only had the choice between either lousy quality or a high degree of complexity: On-reel sound has about the same fidelity as medium wave radio and can no longer be recorded live. Sync sound solutions are antiquated and prone to malfunctioning. Logmar’s modern solution is genuinely innovative. The sound functions (more on them below) aren’t the only new feature. The film feeding mechanism and control unit are unique. Next to a real locking claw, the camera has its own, solid pressure plate and a combined film winding roll along with a bunch of technology that simply didn’t exist back in the times when Super 8 cameras were built. Let’s start deep inside: with the camera motor. It’s amazing how quietly it runs, with a healthy hum. I realize, in utter surprise, that the frame rate can be adjusted in the camera menu with a precision of four (!) decimal places. As Lasse explains, the camera is driven by a Maxon D.C. motor, the same used in the Mars Rover – the best of the best. Other motors, such those of the manufacturer Faulhaber, didn’t meet the high standards of the two Danes. This motor is controlled by a completely autonomous circuit that runs independently from the rest of the camera’s electronics, thus ensuring highest precision. 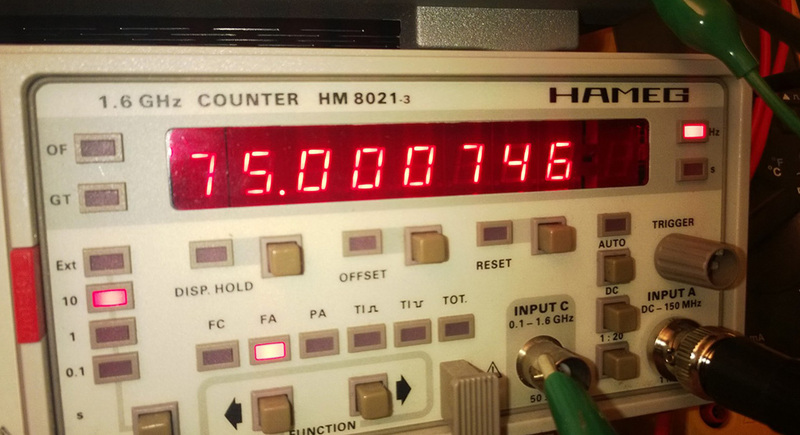 A PLL, clocked by a 100 MHz DDS, makes sure that the camera reaches its correct rotational speed within a few milliseconds. From the first to the last frame, the frame rate remains exactly constant. The error rate after ten seconds of the motor running is below 0.0003 fps. This means a tolerance of a single frame after 90 minutes of filming – which, however, will never occur thanks to PLL control. 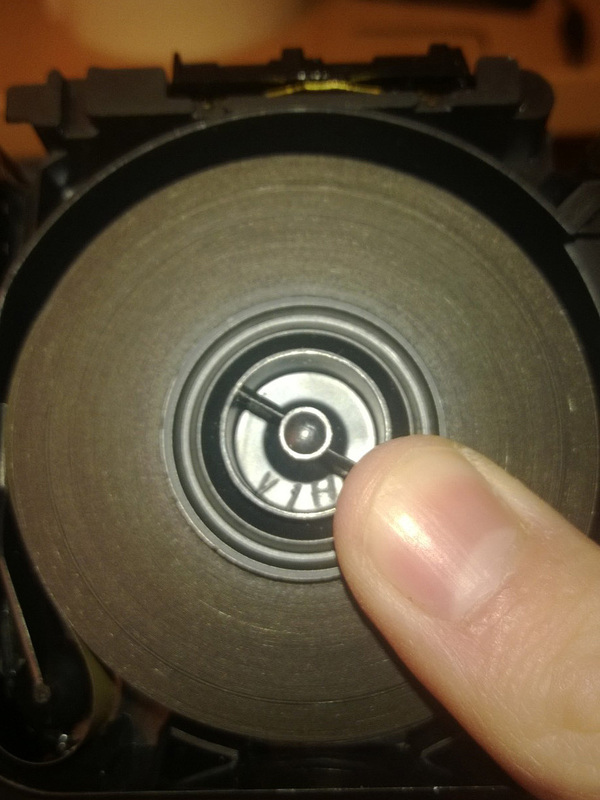 Here, the rotary shutter generated three impulses per turn. With 25 fps, 25.000248 fps would be reached over the course of 10 seconds. [alert type=“info“]A DDS (Direct Digital Synthesizer) is a component that can produce any frequency with absolute precision. Unlike a quartz, it doesn’t have an oscillation frequency of its own, but can be programmed in very small increments. The PLL (Phase Locked Loop) ensures, simply put, an exact coupling of the DSS’s input frequency with the camera’s selected frame rate. After fractions of a millimeter, the desired speed has been reached and will be perfectly kept from then on. Conventional quartz controllers often need several seconds until the control circuit has been locked in. The Logmar camera, however, keeps everything from the first to the last frame in lip sync. The motor used is so powerful and precise that it could easily drive frame rates up to 100 fps. However, it’s not clear yet whether camera mechanics and film material would cope with this stress in continuous operation. For the time being, the Logmar camera will be limited to a maximum frame rate of 54 fps by firmware. The Logmar’s film transport is no less special than its motor drive. Like the ultra-rare Mekel high speed cameras, it includes a mechanism to push back the built-in pressure plate of the Super 8 cartridge and form a loop from the film that has been pulled out. This way, the film is transported just like in a classical cine camera. It eliminates the disadvantages of the Super 8 cartridge almost completely. Cartridge jams become a thing of the past, image steadiness couldn’t be better, even with stubborn and non-compliant film stock. There is an emergency shutdown at the lower film loop. If the loop disintegrates, for example at the end of a film reel or if blockage occurs, the camera motor will stop immediately. The camera’s feeding mechanism is remarkable as well. The carrier is equipped with a built-in fixed pressure plate made from anodically oxidized aluminum. On top of that, it also has a real register pin. Its construction exceeds that of the drag lever used in the Nikon R10 for improving image steadiness. The Logmar’s register pin firmly locks the frame the whole time during which the shutter lets light onto the film. This ensures optimum image steadiness. The register pin, by the way, is dimensioned in such a way that it will exactly fit the film’s perforation and hold it free of play. Our test film shows how good this works: When projecting with a diagonal of two meters and dialing the frameline into the visible area, it doesn’t move a single bit. No 8mm camera ever reached this level of image steadiness, not even the best Swiss Double Super 8 (DS8) cameras. 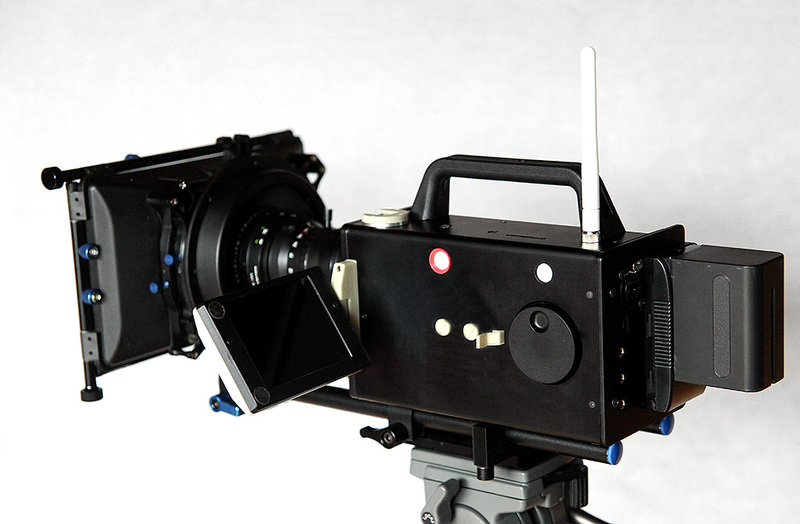 Similar to Max 8, the prototype camera shoots a wider-than-usual frame for Super 8 – „as wide as possible“, Tommy says. The corners are slightly rounded. It remains to be seen whether this feature will remain in the production cameras. The Logmar’s viewfinder system is no less unique. It resembles Beaulieu’s viewfinder but with only one shutter curtain. This way, one sees right through the camera lens without parallax displacement. At the same time, 100% of the light entering the lens ends up on film since there’s no viewfinder prism. Neither does the camera have swivel-in filters. This, once again, improves image quality. And unlike in practically all other Super 8 cameras, there’s nothing but air in between the lens and the film emulsion the moment the film gets exposed. This also means a large and bright viewfinder image good enough for pulling focus in dim light. The viewfinder image can have any size, since the optical viewfinder has been replaced with a small CCD camera rendering the viewfinder image on a monitor. For this purpose, the Logmar includes a camcorder-style side-mounted swivel LCD display. Since the video signal is routed to an external port, a field monitor can be mounted on top of the camera. Alternatively, a large (remote) monitor can be connected, or the signal can be recorded, but only in SD quality. For video buffs, it will be strange to see the viewfinder image flickering in the selected film frame rate during the recording, but seasoned Beaulieu shooters will feel right at home. Unlike its first prototype, the camera no longer contains a dedicated monochrome LCD for its setup menu. All settings can now be conveniently adjusted via a button, a dial and an on-screen display. Through this display, all important settings such as frame rate and battery level always remain in sight. Of course, a frame counter is included. It shows both the exposed and the remaining frames of a cartridge. Since the camera automatically shuts off when a cartridge is full, no single frame will be wasted. Conversely, no shot will get lost on the „Exposed“ part of the film strip. As an alternative to the frame counter, exposed film meters can be displayed on the viewfinder, with single frame precision. The camera still has a beam-splitting prism, but only behind the viewfinder mirror. It directs part of the light to a TTL metering photo diode. In the model tested, the meter wasn’t ready yet. Pros don’t mind using an external meter anyway. Ultimately, the camera will provide incident metering that honors the chosen frame rate. The camera currently has a 180 degree shutter, but this may be subject to change. Adjustable shutter angles will not be provided since it’s simply too complex to implement. The heart of the new camera is an ARM Cortex M3 CPU, used as a micro controller – a very powerful and complex all-rounder. It’s the main reason for the camera’s flexibility and versatility. Users won’t take notice of what’s happening under the hood but enjoy the simply yet powerful functionality and future camera upgrades via firmware. The ARM micro controller coordinates a whole bunch of different specialty modules. It provides the camera’s On Screen Display menu, controls the frame rate unit, the USB port, wireless network connections, the audio section, exposure metering and more. 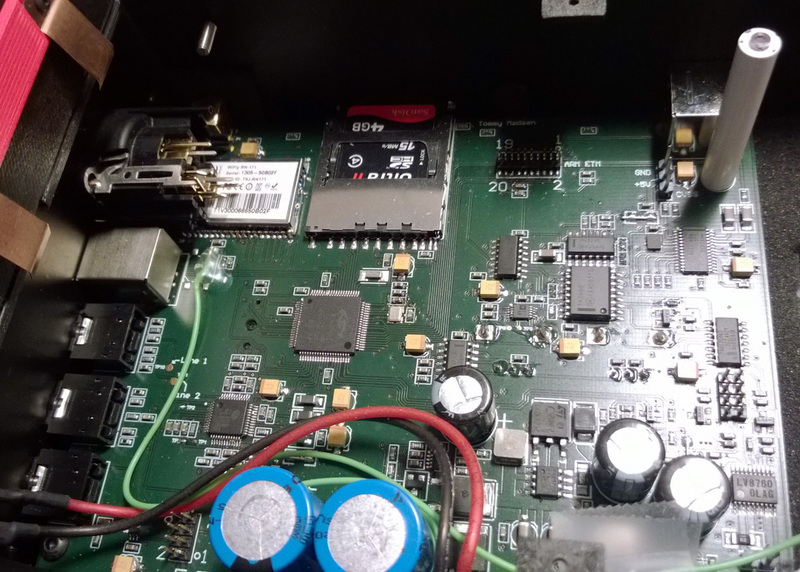 One of the main board’s many revisions: a WiFi chip, SD card reader, Scilab ARM mikro controller, JTAG port, DDS and PLL motor controllers, On-Screen-Display chip and Sanyo motor driver which unleashes a power of 24W without cooling. Past Super 8 cameras came equipped with electronics, too, but a real micro controller architecture like the one used for the Logmar is a completely different beast. Since all relevant metering and control processes are implemented in software, firmware updates can not only fix bugs but also provide entirely new functionality. The camera is well equipped in this respect: USB and WiFi interface the Logmar with the rest of the world, its architecture is open for extensions. The Logmar’s core virtue and likely killer feature is its live sound recording. Sound capabilities by far exceed what Super 8 film offered in the past. For users, it couldn’t be simpler: All you need a run-of-the-mill SD card put into camera. It will record one self-contained, lip-synchronous audio file per take, with the exact date and time of the recording stamped into the file name. 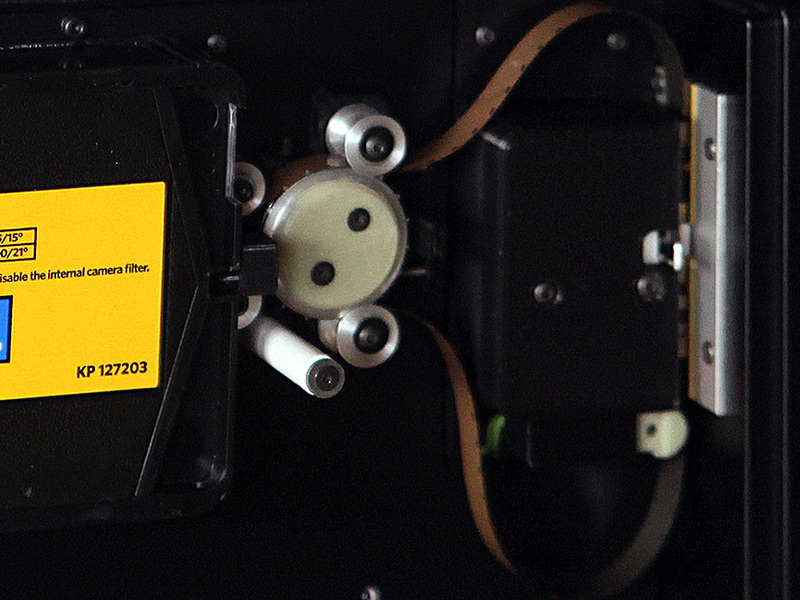 After shooting, the camera or the SD card can be connected to a computer, the audio files dragged underneath the digitized film tracks in a video editor (or concatenated for dubbing them onto the soundtrack of Super 8 reels) – that’s it. This is another part of the camera where the job has been done properly. The heart of the sound engine is a 1063 chip of the Finnish manufacturer VLSI. This little circuit can not only play back audio files in all kinds of formats, but also record them in highest quality at 16 Bit and 48 kHz sampling rate. The VLSI chip is highly extensible, too, supporting DSP plug-ins, real-time audio analysis and different sampling rates. Thanks to wall-clock time, it offers high timing precision. Lasse still works on firmware changes that will let users adjust bass, treble and automatic gain control sensitivity. An optional, variable-attack audio compressor is being planned, too. Similar new functions will likely be provided via future firmware updates. For audio input, there’s a 3.5mm mini jack with automatic microphone or line level switching. Professionals will welcome the Neutric XLR/6.3 combination jack with 48V, short circuit-proof phantom power. Input selection is fully automatic, audio levels can be automatically or manually adjusted (with a knob dial, not with flimsy buttons). There’s a headphone jack for controlling the live sound. Audio meters (that also display clipping) can be directly viewed in the viewfinder’s on-screen display. In other words, there are no stumbling blocks for doing professional live sound recording in-camera. The camera still has one more sound goodie under its hood: In the future, there will be an option for recording continuous sound from the very moment that the camera has been switched on. There will still be one audio file per take, but gapless sound recording will obsolete the use of additional field recorders. A camera operator shooting only ten minutes of footage during a live concert will still obtain a high quality sound recording of the entire event, with lip-sync sound. The Logmar will run on stock 7.2V video camera batteries. They are inexpensive, easily available, charge fast and can be bought in different sizes for optional use as counterweights to long lenses. Surprisingly, one such battery does suffice for creating the five different voltages the camera needs: 1.8V, 3.3V and 5V for the different electronic circuits, two times 48V for the phantom power on the microphone jack, between 7 and 30V at 24 Watts for the camera motor running with optimum performance at each fps speed. This kind of perfectionism has no precursor in any Super 8 camera built before. The Logmar’s unique viewfinder system makes the camera behave in ways that will be unfamiliar to filmmakers accustomed to their 8mm Nizos, Canons or Bauers. First of all, changing cartridges is a bit more complex since a film loop needs to be manually pulled out and threaded. And, fortunately, the Logmar disregards the Super 8 cartridge’s ASA notching. It’s left to the operator to correctly set exposure and, if necessary, use conversion filters. In order not to damage the registration pin, one can only remove a film cartridge after the camera has „parked“. In the current prototype, the operator needs to manually trigger parking of the registration pin un the camera menu, or the film will be stuck. For the production version of the camera, the plan is to have the pin automatically go into parking position every time the film chamber is being opened. Thanks to its unique motor control, the camera works without a mechanical brake at the rotating shutter. Therefore, the last picture of each take can optionally be overexposed for an additional few fractions of a second. This makes sense when shooting negative stocks and using flash frames as clearly visible markers between single takes while editing. People shooting and projecting reversal stock can turn off this feature. On top of its various sound connectors, this Super 8 camera boasts unparalleled connectivity. In the mechanical department, a c-mount thread for cine lenses serves as the lens mount. A PL mount would have been possible but has been skipped as a cost-saving measure. On top of the camera is a hot shoe for microphones or lights, on the bottom a tripod socket leaving enough room for mounting a hand grip with a camera trigger. The camera’s most distinctive visual feature is its large top handle for convenient and well-controlled camera movement. In the electrical department, the camera is connective as well. 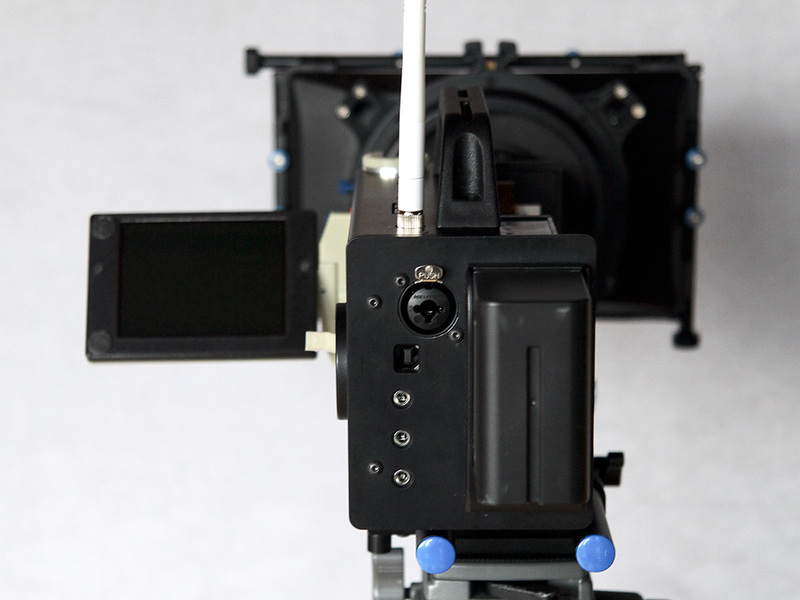 On its top, there’s a socket for the viewfinder’s video signal along with a WiFi antenna. The camera can be remote-controlled via WiFi. Tommy and Lasse plan to openly release a simple yet powerful protocol that will allow everyone to program their own custom applications for controlling the camera. Next to classical remote control, intervalometers and triggering camera takes with motion, audio and light sensors should be doable. The plan is to make all camera settings remote configurable. This should include exact frame rates, single frame shutter time and DSP options. Finally, a USB port provides wired connectivity for firmware updates and transfer of audio recordings from the SD card. Developers interested in the camera’s open protocol can use the USB port to read out debug information. How soon will the camera be for sale? If everything goes fine, around April 2014. The prototype is nearly feature complete, with beta testing starting these days. Ten preorders will be the first step towards the final product. They will allow Logmar to manufacture the moulds and tools for all the camera parts that currently only exist as 3D-printed prototypes. Then, volume production may begin. The introductory price for preordering customers will most probably be between 2,000 and 2,500 Euro ($2,700-$3,400). After an investment of more than 300,000 Danish Crowns ($55,000), more than one hundred manually assembled parts per camera and four years of continuous unpaid labor, that’s a very fair offer. As a special treat, the first brave ten buyers may, if they wish, choose blue or red instead of black for the color for the anodized aluminum camera body. With exact 100 cN, the Logmar neatly winds the film around the cartridge’s take-up core. The prototype with a 10mm Cooke lens and screw-on top handle. The camera body is only slightly wider than top-of-the-range Super 8 cameras from the 1970s. A field test of the camera will follow soon – Filmkorn will provide you with extensive coverage! Nice one Friedemann!!!! A better read than google translate version!!!! I still can’t believe it…amazing!!!!! Certainly it’s fun. But $5000? I have a half dozen super 8 cameras, and I use them for my work. And the total cost for these beauties was less than $200. What TF? $3000?….for a Super-8 camera?. What are they stupid? My bad. I see it’s between $2700 and $3400, which I would still consider way outside of my price range for super 8.
way to expensive. You can buy an Arri 2C 35mm camera for less than that. Sorry but for $3400 you can grab a nice HD video camera, or if you want film plenty of high quality 16mm and 35mm cameras can be held at that price and way under that. Their best bet may be trying to get colleges to adopt them for students and make for more volume and sell around $400-$500 Otherwise they will only be selling very very limited quantities of these. No one in their right mind is going to spend $3500 for a super 8 camera when you can just go grab a digital cam or even a dslr cheaper that will blow it away quality wise, or just buy 16/35mm much cheaper which will also smoke it in quality. Super 8 is fun to play with, but lets be honest here, it looks like crap compared to 16/35mm or digital SD/HD video cameras. Today, super 8 negative Vision3 with good scan you can see very well and, for certain applications look better than HDSLR, it starts to get boring. Not everything needs sharp and clinical picture. Never shoot a corporate video in s8, but rather do it in a video fashion. I don’t prefer the look of HDSLR myself, however that is the modern standard most commercial projects are going to expect(with exception of artistic retro look projects). I am not saying there is no room for Super 8. I just don’t see much market for a $3,500 super 8 camera. You can get a nice crystal sync 16mm name brand camera off ebay for under $1,000 and enjoy the benefits of higher quality footage. That leaves you with $2,500 for film and processing. You can shoot an entire project with higher quality than the cost of this camera alone. This is not a slag against the camera or the makers however, I really would love to see a super 8 camera that is new and not have to worry about it breaking down due to age and questionable maintenance history, however I am just suspicious of the market demographics they are reaching for. 8mm is and has always been perceived as a broke amateur, indie filmmaker format for the most part. Something college kids play with until they step up to 16mm and or 35mm. This camera has to be sub-$1000 to gain any wide acceptance imo. Too many kids(for better or worse) are going to grab an HDSLR for $500 to shoot their short films, if they want the 8mm look, they’ll just add it in post-production(obviously not as good as using real film, but this is more common nowadays). Those who want actual film, can easily grab a used 16mm or 35mm camera dirt cheap these days. I applaud the idea of a new super 8 camera. I just think for any amount of success it will have to be much cheaper to grab the attention of a larger market. There’s too many cheaper and superior options out there to make this viable as a business. There have been many great products and companies that failed just simply due to being too high priced for anyone outside a small handful to keep the company afloat, which is where I wonder about this camera and its creators. I am not looking at this from an artistic perspective(video vs film, hd vs 4k, etc), but from a business prospective. How many people will want to pay more for an inferior camera? Not many. However if properly priced, it could be all the rage and boost the camera makers and the film suppliers bottom line. I just don’t see it being viable or successful at $3,500 a pop. This could be perfect for amateurs. Most pros are going to opt for 16mm or 35mm, most kids would rather deal with hard drives and memory cards. There target needs to be young aspiring filmmakers, but at $3,500 they may be shooting themselves in the foot as most will scoff at the prices and either use HDSLR with unlimited „film“ or simply grab a superior 16mm or 35mm camera. Sorry if I sound doom and gloom, I actually want this work and for the company to succeed, because it could inspire a new generation back into film. But priced too high many will simply pass and grab their HDSLRS and digicams. Hopefully they will properly analyze the marketplace and create a price tag that allows consumers to buy without hesitation and for them to remain profitable. Frederic, BMCC is a great example! it has been a huge success and something they should look at, and also they need to take a look at the lomography industry now! Lots of people love it and are getting back into film because of it! it’s not super mainstream per se, but it is helping with the continued purchasing of film stock which will keep Kodak and Fuji pumping out film and not discontinuing too many more stocks. We’ve already lost enough as it is. I agree with the price range you suggest. As far as sound and LCD screens, etc. Maybe they need to try to get this model in the price range you suggest or even slightly higher(but not by too much) if it can maintain the sound board and all the fancy stuff and then make a stripped down mechanical version. Unlike the super 8 of the past, no one will be using this for home videos by regular people any more so people buying this will be serious about film and equipped to run their own sound separately. All it really needs is crystal sync, run at 24fps and to be quiet enough to run a boom mic or lavalier for dialog. I could see them marketing this as their flagship camera, and then having a bare bones mechanical model that they could sell to countless colleges and film students. Heck the K1000 and FM10 are adored and still used massively for photography courses and students and I still see tons of new lovely photos being generated from those two cameras that just blow away digital IMHO, there’s just something intrinsic about film that makes it so beautiful and elegant. They have a huge potential market, The Krasnogorsk 3 and Canon Scoopic are frequently asked about on cinematography forums by those wanting to shoot film for the first time, but people get discouraged when they realize it’s near impossible to run sound due to loud camera noise and the lack of steady frame rate without added headache and expense in mods that still may not solve their problems, If they can make a cheap, mostly mechanical version of this that allows sound to be recorded separately out of the box, all of those people looking to get their foot in the door with real film making would flock to it and they’ll be rolling in orders. Hello, and congratulations on your persistence, vision, and, well…courage, especially! I’m not sure all of the technical spec are described, most importantly, I don;t actually see a description of the view finding system, other than a mention that it will be unique. Mirror-shutter? Rotating, guillotine or half-silver, like the japanese cameras? In any case, bravo, looking forward to following your projects, and products! Jeff: I am glad to see you will not be investing. Others will gladly do so for this forthcoming precision camera. They are not designed to sell mass quantities as per Blackmagic cameras of which you hold so dearly, I have no interest in plugging into the massive cheap digital zeitgeist where there is no image distinction. Film emulsion and engineering are the definitive reference irrespective of digital emulation attempts. Both are separate and distinct. The haughty suggestion to „lower“ their prices is immensely disrespectful of the Logmar team’s unpaid labour and material costs. I’ve seen a lot of comments stating that you can pick a a decent S16 camera for cheaper and that’s simply not true, because i’ve been looking. For 3K you won’t get much more than a camera body that may or may not work. For a working package with mags, lens, and batteries you’re looking at 8K and up. I’ve seen first hand what Vision3 can look like in S8 with my old but very decent cameras, and it’s really unique and amazing, One of my cameras is a new old stock Canon 814XLS that does an amazing job, However this camera will take it up a few levels with a more wide screen friendly frame, guaranteed steady image, and better lenses. With those improvements, you have a serious format that is nothing like what we are used to seeing. There are also new desktop telecine machines out, which i happen to own, that cut out the transfer costs and offer excellent results, I’m hoping they add single frame and time exposure to the firmware, and then i’ll surely get one. Then you aren’t looking in the right places. You can by an Arri BL package for under $1,200.00. You can buy an Arri SR Super-16 pkg. for under $1,500.00. There’s an Arri SR2 with two mags and several other accessories for a buy it now price of $1,500 on Ebay right now bidding starting at $299, Just needs a lens, which you probably already have that will fit it and it’s ready to go. The deals are out there, just have to scan from time to time to see when good deals pop up. It can be pain waiting for the deals but they are out there. Really the lighting is what’s most important anyway imo. A good Mole or Arri kit and you can make some magic happen even without a 10k lens 🙂 That’s why I am hesitant to buy a S8 cam for $3,500 when there’s much better deals out there for S16 and 35mm cameras. Format 16:9 ? only posible with optic Scorama system or similar. Please mail a catalog to buy the Super 8mm camera. I need one !!!!! Some people miss the point of this new s8mm camera. Its not designed for the demestic market. Mostly for professionals who have used super 8 shooting commercials and pop promos and a number of feature films have also had heavy use of s8 film stocks. As for fuzzy unstable pics from old cameras.This is no longer the case with this new camera. You can’t compare the picture quality to 16mm, 35mm once transfared to 4k. This is a cost saving for any professional. Lastly film is looks better that dslr hd does. So its the professionasl choice. Well for pros who prefare to shoot film. I guess I feel betrayed. 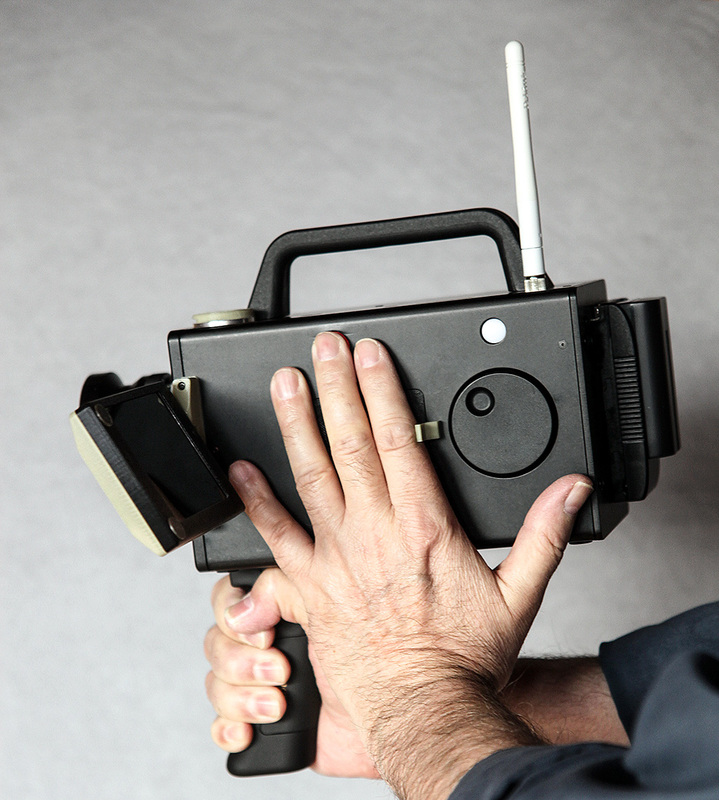 Super 8 is an inclusive community that allows micro filmmaking efforts at reasonable prices. When I see the price hike (from $3500.00 to $5000.00 dollars already), it feels like a betrayal. Someone gave these guys some bad advice in their price increase. They started this endeavor passionately . . . and they have sold out to the idea of exclusivity. That’s not Super 8. Your assumption is very wrong, Jeremy… the guys totally underestimated the actual cost in making a small batch of these cameras, including about a 100 custom high precision metal parts. Even with the new price, they make almost no money with it, if at all. It is different to make 100 or 100000 cameras.